Thank you very more much !! Thanks for the templates for the best mod ever! Now I can convert some of the older spec skins onto the 2009 spec model. They are the 2010 Spa 24H skins. Fantastic templatea for the best mod for rfactor ever well done enduracers. Thank you. Great time for releasing these! Our league should be ready with new cars for the enxt round in Jan. Okay maybe I'm just an idiot... Which is true... But, why does it seem to me like the F430 template doesn't have headlights? I've opened the template and directly exported it to DDS and the headlights aren't there, so something isn't right, and I will admit, I'm a few Warsteiner's deep right now so it might be me lol. Other than that, absolutely spectacular work! Having way too much fun painting over here! The headlight glass texture is on the windows template. Thanks for the response. I noticed that the headlight glass is on the window template, but on the cars that came with the game, you can see through the headlight lens and see the projection headlight underneath. As comparison, the Corvette template has the actual headlights on the body template. When I finished with my skin, I put it in-game and the headlight lenses suddenly appear opaque, even though I didn't touch them in the window template(I did adjust the Ferrari banner on the windshield though). I can't really tell if it's that the headlight lenses are opaque or if there's just nothing(i.e. no headlight) underneath. It's possible I missed something on the template -- If you could point me out which part of the template is the headlight, that would be awesome. Thanks for your help, you are both a gentleman and a scholar! Okay, dunce of the day award here. I got it working, dummy me I accidentally merged the window colour when converting, hence gray/opaque windows. Got it just fine now, thanks for the help! Could someone please link me to the panoz GT2 car, I have looked everywhere and cant seem to find it. And are there X-files available for these templates anywhere ? On the ISI rFactor.net web site the template is available. Im new to skinning and im using GiMP and I cant get the alpha channel right on my car and its shiny as hell. Can anyone help? 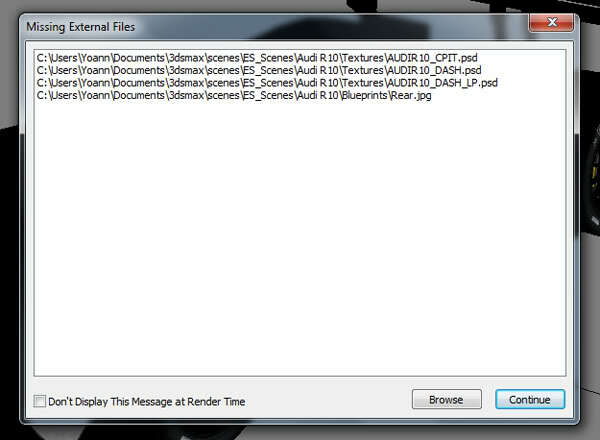 Hi guys, can anyone tell me how to fix this issue when I open the render scene for the Audi R10? And can someone please link me to the Brazil renderer thing? anyone have the car for 3dmax2012? Hi guys i am wishing to download the templates to do some skins my team will use in a league. The thing is links that are there are asking for phone numbers before it will let you get them. It never used to do that. I do wish to give out my number and i know they will charge me if i did give it to them. Can you please upload to a new host. No phone call needed to download on my side. Click on the second button (not the gold), but regular on the previous page you show. And after close the window using orange cross on the top right.